I have spent some 10 year trying to explain that being a crossdreamer and experiencing cross-gender fantasies does not mean that you are not transsexual (to use the medical term). I have argued that crossdreaming can be a valid expression of gender dysphoria and that all who experience distress from their such feelings should seek help. Indeed, I have been criticized by some crossdreamers for saying that all MTF crossdreamers are transgender women. And now you tell me that some visitors to my site believe that I am telling them not to transition. I have never done that. Never. I guess one possible explanation for this misunderstanding is that they – due to external as well as internalized transphobia – are desperately looking for a way out of their dilemma. What you say about your own reading of my blog, indicates as much. Since my sites include narratives about crossdreamers who are not dysphoric and do not plan to transition, they latch on to that, telling themselves that "that is me! I am not a trans woman" (or a trans man, as that might be). And I suppose some may interpret the fact that I have not transitioned to mean that they should neither. Still, it requires a very superficial reading of my blogs to interpret me this way. I am very much aware of how vulnerable my readers are. I am also very much aware of how diverse they are, also as regards gender identity and sexuality. Which is why I always tell crossdreamers in need to get help, and that they should consider the possibility that they are suffering from gender dysphoria very seriously. I have also been very clear about my own life. The fact that I have not transitioned is not an example I recommend others to follow. I am struggling with severe gender dysphoria every day. Under different circumstances I would definitely have transitioned. 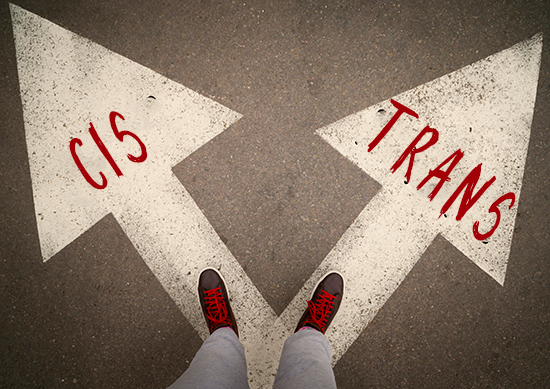 Moreover, I have written numerous articles about crossdreamers who have found out that they are gender dysphoric and who have transitioned, and I have presented a large number of trans activists and their thoughts about toxic and invalidating terms like "autogynephilia" and how transitioning made them whole. On the other hand: I cannot write that all crossdreamers are gender dysphoric transsexuals and that all should transition. Many of my readers are somewhere else on the continuum. One third of them report severe gender dysphoria, the rest do not. Even if we argue that a significant portion of those who say that they experience no or little dysphoria are deluding themselves, there will still be a significant number for whom crossdreaming is just a way of expressing another side of themselves, and not a full blown gender identity. I cannot tell them who they are. I don't have the right to do so. I know that most of the suffering transgender people go through is caused by a bigoted and unforgiving society and that many suppress their own identity, but in spite of that: The only person who can know if someone is truly transsexual is that person. All people like you and me can do is to help them sort through the debris of broken childhoods and shattered self-images, so that they, themselves, can get to the core of who they truly are." Let me make this very clear: If you, my reader, is a person who experience strong and continuous distress from your crossdreaming, that might perfectly well be an expression of severe gender dysphoria. Gender dysphoria refers to the distress that may accompany the incongruence between one's experienced or expressed gender and one's assigned gender. Although not all individuals will experience distress as result of such incongruence, many are distressed if the desired physical interventions by means of hormones and/or surgery are not available. As you can see, not even the DSM-5 has a clear cut definition that removes all doubt about what a transgender person should do transition wise. Life is not like that. Gender is not like that. This is why you must read this blog as repository of facts, terms, stories and ideas you can use on your own journey in order to find out who you truly are. No one else but you can do that. Jack, for anyone to say, blame, or argue that your blog or any similar site “caused” them to do much of anything is preposterous. I suspect that these people, in their search for rationalizing their behavior and decisions cast their net in your direction and, well, here you are, evidently taking this seriously enough to write a long response as well as a blog post. If it were me I think I’d give them a sentence or two and call it a day. But this does give me an opportunity to talk about where I feel crossdreamers are in the mix, so to speak. Just my opinion so please take it advisedly. To be transgender is to be under the “umbrella” with some gender dysphoria, where each individual attempts to determine what they need and can do to mitigate those feelings and live their lives. 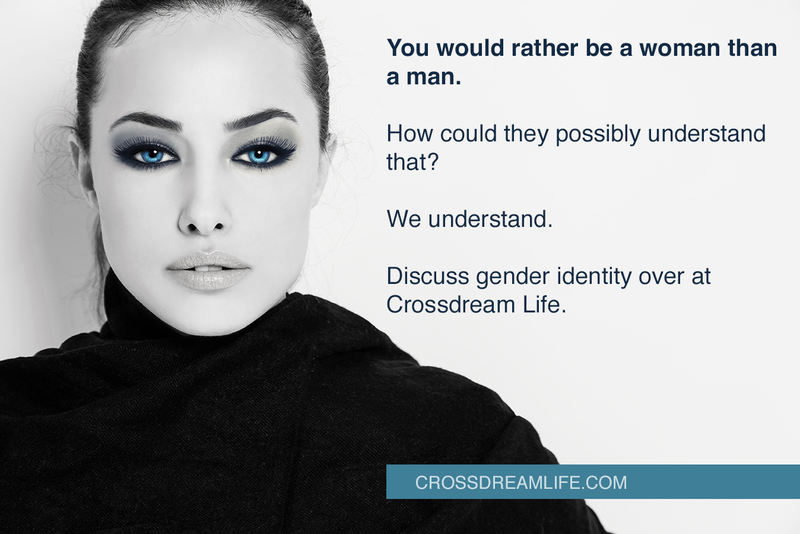 I think all trans people are or have been crossdreamers. I certainly started off that way in early childhood and even today as a transitioned trans woman I have many such dreams. To each his or her or their own. Everyone’s mileage varies as they grasp at determining what they need and can do about their gender dysphoria. To blame you or anyone else is silly.. I often post on r/transgender because I think the place is in desperate need of some alternative narratives. However, I now have a protocol where I never read the replies because I just found them so awful and nasty. To be honest, it's the sort of attitude that has made me run a mile from the word/community/vibe of 'transgender'. Technically I see myself as transgender...but I associate it too much now with the sort of people who inhabit r/transgender. I’m scratching my head here. I understand not feeling comfortable with people found at r/transgender (I assume Reddit?) and, even, a wish to provide an alternative voice of reason. But at some point (like, now!) if it just isn’t the right place to be, why not just leave? You’re staying there reminds me of the humorous yet ironic “definition of insanity”: repeating the same thing hoping for a different result. And, seeing yourself as transgender (technically?)... I do understand being uncomfortable and worried about that. Oh, and then feeling a need to label myself within the trans umbrella. It helps me to continue pushing and expanding my gender boundaries, observing how I feel within, and with repetition and exploration learning that my being transgender is wonderful and something I’m rather proud of! Emma, thank you for saying "being transgender is wonderful and something I'm rather proud of!" This needed to be said by someone. If we think of being transgender as a gift instead of a burden or a curse it changes the whole dynamic of how we deal with it. The gift is our ability to identify with and experience our femininity. There are many burdens associated with the gift. One of these is not being able to outwardly express ourselves as who we actually are. I understand the need for alternative narratives, and since r/transgender is often the first subreddit transgender and gender questioning people go to, it is important that ideas like "crossdressers are just fetishists" are not reinforced. There are, fortunately, also a lot of sensible and compassionate people over at r/transgender, so in many cases this will turn out right. I have heard a lot of people say the same as you, however. Some have even established an alternative r/transspace subreddit as a more open and tolerant safe space. Jack: I agree, I wouldn’t post in places where I experience or see a high risk of such attacks. I just don’t have patience with such people. I don’t actually read, follow, or use reddit. My comments were, I hoped, thoughtful and engaging. In hindsight though I now hope they weren’t offensive in any way. If so I sincerely apologize. There was nothing offensive about your comments. They were to the point and you raised a very interesting question: Why stay in a community with selected trolls? And who should stay if any. My general rule is that you should not expose yourself to such attacks unless there is a fairs chance that responding will help others (and if you have the mental health to take it). I rarely go into such discussions with the hope of making the trolls understand. "I don't have dysphoria. I'm okay with being a guy." When, they're not really. Humans are very good at adapting their beliefs especially when they don't view any way to get out of their situation. "I can't transition, so I'm okay with being a guy". I never realized what transitioning could DO. I mean, "Yes, I would LOVE to be a woman, but I'm not trans. Those other people are, they're so lucky." I didn't realize that even just HRT could possibly do so much to change your appearance. Although YMMV, you've got a good chance of not looking like a guy in a dress. So people (and me) convince themselves that they're okay with just being a guy. There's a difference between being content with being a male, and accepting you're being a male.